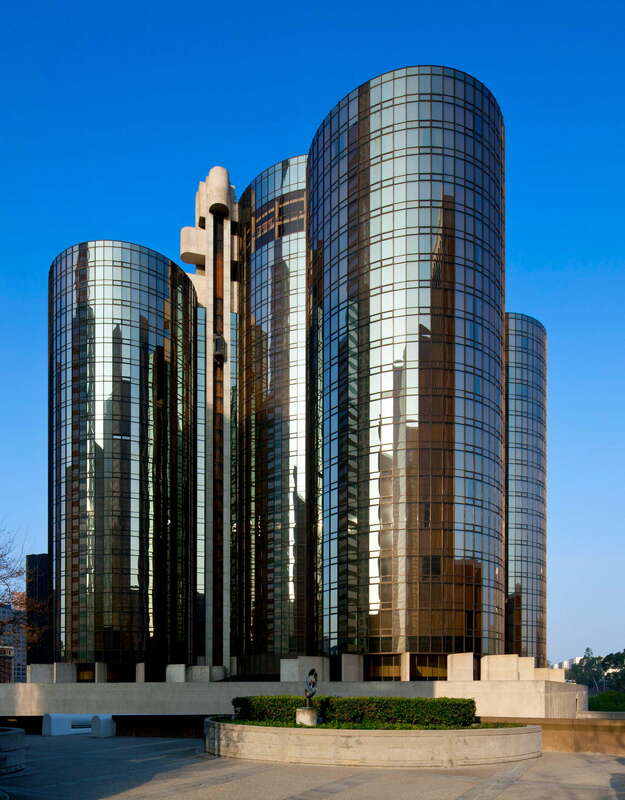 You might recognize the Westin Bonaventure interior as the spaceship being built in Interstellar. Or the hotel where Arnold Schwarzenegger rides a horse into an elevator in True Lies. Or even the backdrop for the famous shootout scene in Heat. Listen, the glass cylindrical towers and sprawling interior has proven pretty irresistible to filmmakers over the years. 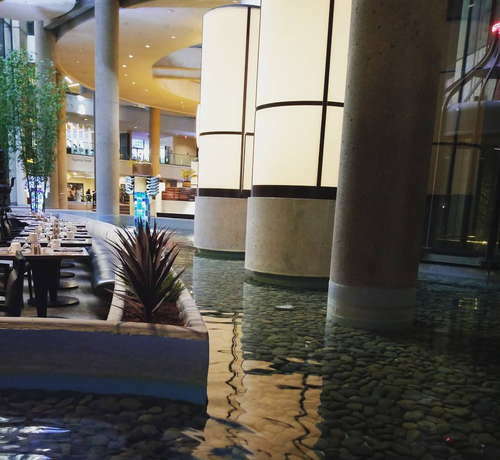 For guests, it’s the city-within-a-city that drives them to the hotel that includes countless restaurants, retail space, boutiques, salons, bars and the largest number of rooms in all of LA. Filmmakers and travelers agree: this hotel is good. There are more than 1,300 rooms here that range from standard studios to lavish suites. 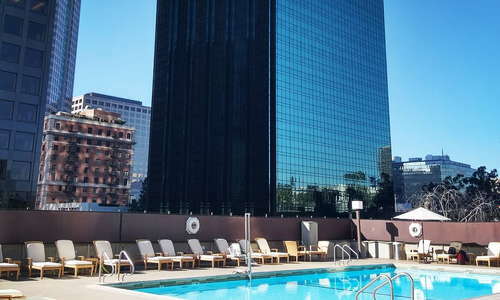 There are no balconies in the hotel, but rooms come with million-dollar views of Downtown LA’s skyline. Other in-room amenities include free WiFi and coffeemakers--the essentials. Room service is 24-hours. You'll never go hungry here. Nearly all bathrooms have shower/tub combos while higher-end suites are decked out with lighted vanity mirrors, standalone tubs and giant showers. This hotel is kind of like a small city. 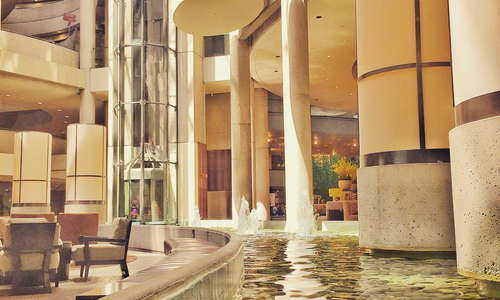 The hotel lobby is humongous with towering pillars, sprouting fountains and a central bar. There's even a FedEx office in there. 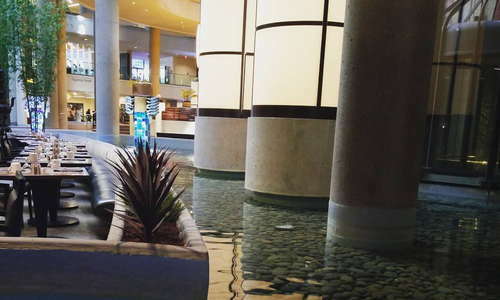 Just above the lobby are multiple floors with restaurants, boutiques and salons. 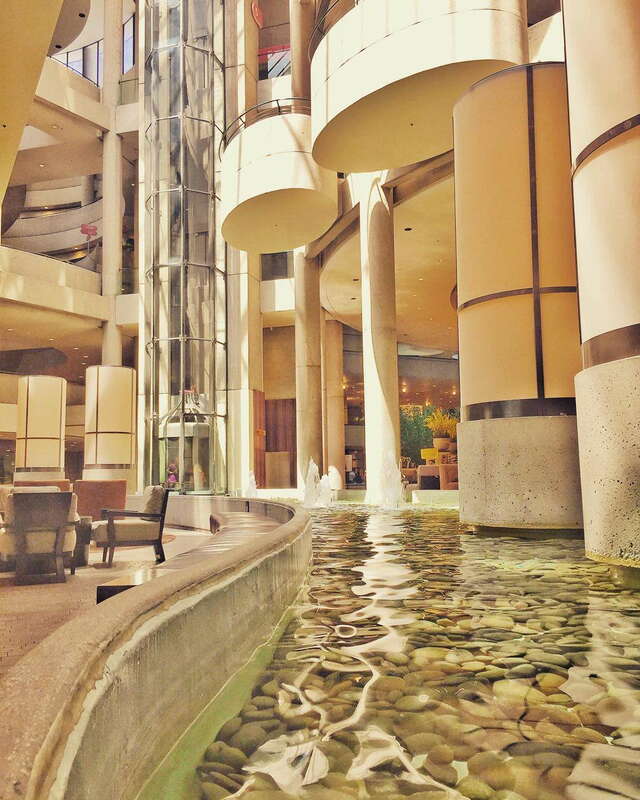 Guests can relax on overhanging pods that look down at the fountains and pedestrians in the lobby below. The Bonaventure pool sits on a massive deck outside the hotel and is surrounded by high-rises in the Financial District of Downtown. Guests can get eat and drink while catching extra rays off the hotel’s glass façade. The hotel doesn’t manage the spa taking up one of the retail spaces, but they do offer an array of in-room options from facials and massages to waxing and skin care treatments. The WestinWORKOUT® Fitness Studio is a large space with lobby-facing windows and is equipped with cardio machines, free weights and an indoor track. With around 19 restaurants and cafes, it’s rare that you’ll have any problem finding something to eat. 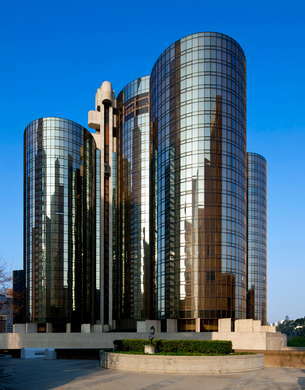 The signature restaurant of the hotel is LA Prime, which serves mouthwatering steaks from the 35th floor. Lakeview Bistro off the lobby is the hotel’s go-to place for breakfast and lunch. Check out Bonaventure Brewing Co.--an independently owned brewery with award-winning craft brews and tasty bites. One of the cooler spots in the hotel is the Bonavista Lounge on the 34th floor. Here, locals and guests can imbibe on specialty drinks in souvenir glasses and chow down on wraps and sliders all while rotating 360 degrees every hour (yes, the entire lounge rotates and your view changes accordingly!). The Lobby Bar in the center of the hotel is also a nice little scene for cocktails in a busy environment. Downtown is a great walking area and the hotel is within reach of restaurants, bars, shopping, museums and concert halls. The metro has multiple stops, including a station two blocks south of the hotel that can take you to Santa Monica, Hollywood or even Universal Studios. Catching a ride, be it a taxi or Uber, is also easy in this heavily trafficked part of town. You Should Know: Walking around downtown at night can sometimes be a little unsafe. We recommend driving to most destinations, though daytime is perfectly fine. Besides the 19 and counting options inside the hotel, it’s worth venturing farther afield for the Downtown dining scene. Grand Central Market (13-minute walk) has dozens of breakfast, lunch and dinner options for the fickle eaters who can’t make up their minds. Badmaash (4-minute drive) is a fun Indian gastropub with insanely good chicken tikka masala and craft beers. Whiskey lovers will lose their dang mindsat the unlimited (and rare) options found at Seven Grand (5-minute drive). For a hidden gem, check out The Varnish (6-minute drive), a cocktail-crazed speakeasy in the back of Cole’s--one of the oldest French Dip restaurants in town. 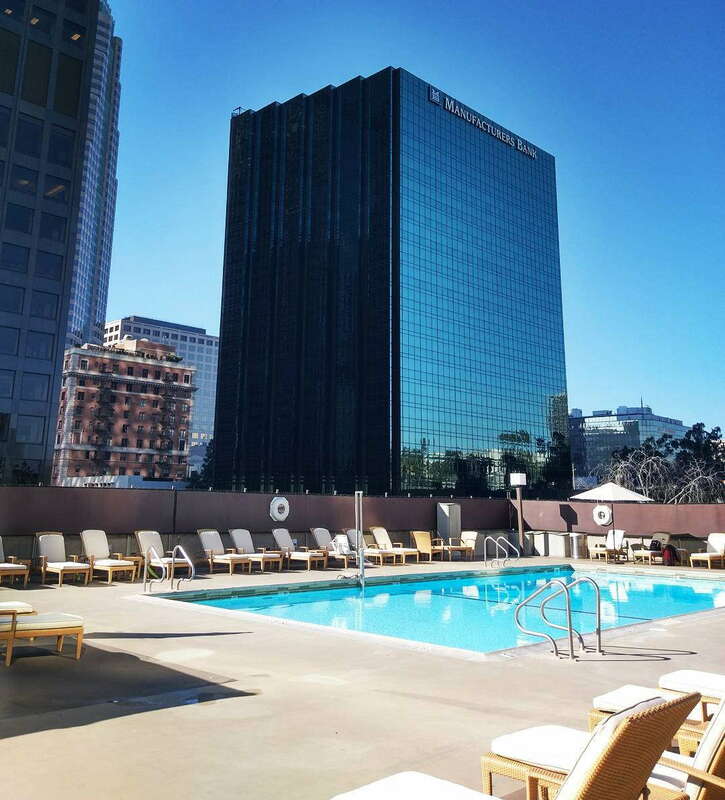 As the biggest and maybe most famous (by movie standards) hotel in LA, the Bonaventure is a classic spot that caters to business travelers, tour groups and international tourists. A personal touch is hard to come by with 1,300+ rooms, but there are so many things to see, do, eat and drink, you may not even notice. Around the hotel are incredible dining and drinking options and access to public transit makes the rest of the city incredibly accessible. 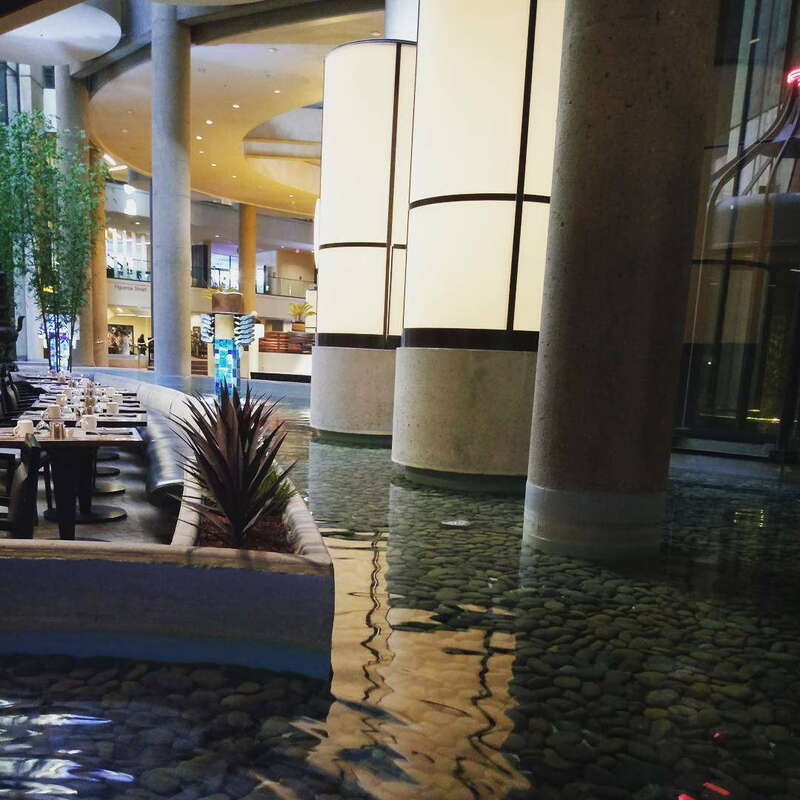 If you’re not intimidated by rotating floors, giant columns and cities within buildings, you’re going to love the famous Bonaventure Hotel.